Most businesses will spend a lot of time and energy working to acquire new customers and build up various products and services, while at the same time possibly causing their current customers to feel a little left out. In our fast paced world, it can be an easy thing to do. But it can also be a costly thing to do as well! Following are seven tips on how you can be sure you're cultivating happy customers, saving time and money - and growing new customers too! Happy Employees: It's important to hire employees who genuinely care about the customers you are providing a service for. As an example, consider a salon franchise that works primarily with children. Employees should either have a successful background working with kids - or have a manner that children and parents will be comfortable with. You may also want to see how a potential employee responds by immersing them in the culture of your business for a short period of time before hiring. Employee Education: Business owners may wish to develop team goals or principals that your employees are mindful of while working and interacting with customers and each other. These principles also may help guide employees to be more comfortable making decisions on their own. For example, Shear Madness Haircuts for Kids has their own "Top 10 Madtastic Goals" that are vibrantly displayed in all of our salons. Employee Confidence: Help employees understand that one of the most important factors in the operation of the business is customer service. Employees SERVE the customer, and are working hard to help customers have a great experience that they'll want to be sure to return for in the future. Listening to your Customer: Your business will want to make sure that it's listening and responding to your customers through traditional customer interaction (phone calls and conversations inside your store), as well as the internet (customer reviews and internet sites that mention your business) and social media (facebook, google+, twitter, blog posts and more). In all interactions, be sure to be friendly, patient and show genuine attentiveness to what they might be needing. Ask Questions: Ask the appropriate questions in response to a customer need so that you can understand exactly how to help (and avoid frustration). Consider asking the "Five Ws" - or those questions that help in basic information gathering. Who is it about? What happened? When did it take place? Where did it take place? Why did it happen? Also pay attention to body language (verbal and nonverbal communication)! Customer Education: Create content that helps educate your customers in a creative and fun way. Remember that educational content doesn't have to be bland and boring. It can be fun and exciting, such as contests on social media, comic books describing a process, crazy how-to videos, and more. The more your customers love your content, the more you're helping educate and market your brand to your customer - and helping draw new customers in! Following Up with your Customer: Make sure you've done all that you can in order to help a customer leave your business happy. If you promise to do something for a customer, don't take too long to fulfill your committment, or worse - forget! And although it may seem obvious, make sure you're thinking of your customer as a real person just like you, and not just a number. So at the end of the day, by making sure that current customers are happy, you'll not only foster trust and loyalty towards your business, but also bring in new customers through your current customers sharing the great experience your business has provided! 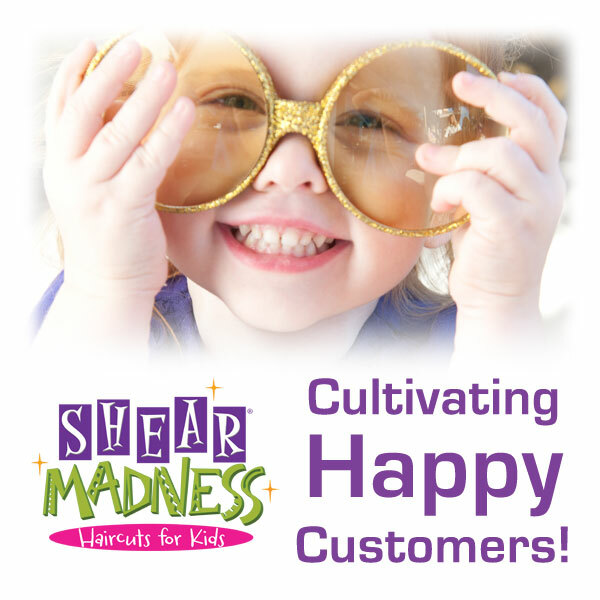 Through years of working in the children's salon industry, Shear Madness Haircuts for Kids Franchising, LLC has learned a lot about how to deliver great experiences for our customers. We work hard to share our many great resources and business experiences so that our franchisees will have the tools to succeed! If you're interested in learning how to become a successful owner of your own franchise, please click below!